Syllabus 2019 Pdf: The IISER Syllabus will be mostly the same as last year’s syllabus. The updated syllabus will be uploaded on the official website of IISER i.e. iiseradmission.in. The IISER Aptitude Test syllabus generally follows the NCERT syllabus for classes XI and XII. So candidates can prepare for it as soon as possible. In This Article we are providing complete information of IISER Aptitude Test Exam Pattern and Syllabus. We also have found some previous year question papers and we will provide you in a separate article. Before IISER Syllabus we are providing the IISER Aptitude Test Exam Pattern. The time duration for the exam will be of total 3 hours. And there will be 60 Questions having equal marks. There will be negative marking of -1 mark for each question, other details are given below. After the Exam pattern lets move to the IISER Aptitude Test Syllabus 2019. The IISER Aptitude Test Syllabus will be based on the NCERT syllabus for classes 11th and 12th. There will be 4 subjects Biology, Chemistry, Mathematics, and Physics. We are providing here subject wise syllabus from the below table. You can also check the official syllabus from the IISER Official website iiseradmission.in. After IISER Syllabus 2019 Let’s move to the one more thing which is equally important Previous Question papers. We have also collected some of the IISER Previous Year Question Papers in our separate article. We have also included available Model/Sample paper. The article will be published soon. 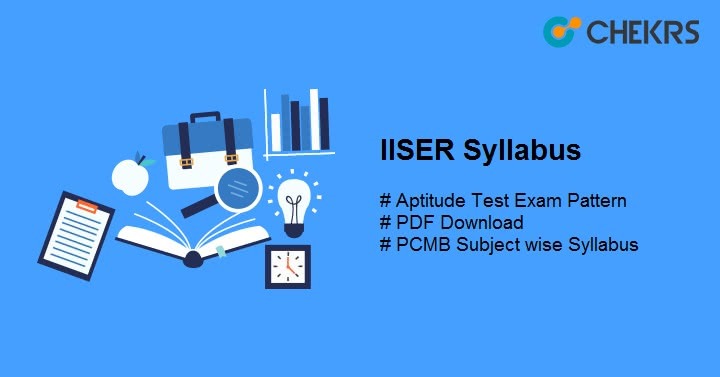 Till then start your Preparation with provided IISER Syllabus 2019 Pdf and Exam Pattern. Good Luck and Keep Visiting.